God's great work is the creation and redemption of the world wrought through the death and resurrection of Jesus Christ. The one essential work in which we are all callled to participate is God's transforming love. According to the 1962 Missal of St. John XXIII the Extraordinary Form of the Roman Rite, today is the feast of St. Giles who was an abbot of the seventh century. He probably lived in the neighborhood of Beziers on the coast of the Mediterranean. The little monastery of St. Peter, where his body rested, became one of the most popular shrines in Christendom and gave rise to a town. The cult of St. Giles, which was general in France, where there are upwards of one hundred and fifty churches dedicated to him, soon spread throughout the west. Today is also the commemoration of the Twelve Holy Brothers, martyrs. They were a group of twelve martyrs whose bodies, discovered in various places in Italy, were translated to Benevento towards the middle of the eighth century. Historically today is the feast of St. Anna the prophetess, who along with Simeon was in the temple when Jesus was presented. According to tradition, St. Giles was born in Athens, Greece, and was of noble extraction. After his parents died, he fled from his fatherland to avoid followers and fame. He went to France, and in a cave in a forest near the mouth of the Rhone he was able to lead the life of a hermit. Legend notes a hind came everyday to his cell and furnished him with milk. One day the King's hunters chased the hind and discovered St. Giles and his secret hermitage. The hunters shot at the hind, but missed and hit Giles' leg with an arrow, which kept him crippled the rest of his life. He then consented to King Theodoric's request of building a monastery (known later as "Saint Gilles du Gard") and he became its first Abbot. He died some eight years later towards 712. In Normandy, France, women having difficulty becoming pregnant would sleep with a picture or statue of the saint. In England, churches named for St. Giles were built so that cripples could reach them easily. 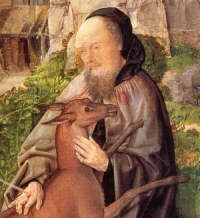 St. Giles was also considered the chief patron of the poor. In his name charity was granted the most miserable. This is evidenced from the custom that on their passage to Tyburn for execution, convicts were allowed to stop at St. Giles' Hospital where they were presented with a bowl of ale called St. Giles' Bowl, "thereof to drink at their pleasure, as their last refreshment in this life." St. Giles is included in the list of the fourteen "Auxiliary Saints" or "Holy Helpers." These are a group of saints invoked because they have been efficacious in assisting in trials and sufferings. Each saint has a separate feast or memorial day. The group was collectively venerated on August 8, until the 1969 reform of the Roman calendar, when the feast was dropped. Patron: Beggars; breastfeeding; hermits; horses; physically disabled; woods; blacksmiths; against lameness; against leprosy; against sterility; against infertility. Symbols: Hand pierced with arrows; hind pierced with arrows; gold doe, pierced by a silver arrow; Benedictine with crosier, arrow piercing hand, protecting hind. Pray to St. Giles for the conversion of England and Scotland. 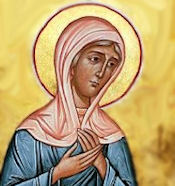 St. Anna was the daughter of Phanuel, tribe of Aser. She married at age fourteen and was widowed at twenty-one. She never departed from the temple and spent night and day fasting and praying. She was in attendance at the Temple when Jesus was presented. Having all her life believed in the prophecies of the Old Testament, she was the only woman in the Temple to greet Jesus.